As a product reviewer, I of course am always trying to get things that pertain to each child's interests and their specific age. There is one thing that very rarely happens in our house because of my kids large age gaps. They never see something that they all want or like. But when I was asked to review Teddy Tank things changed. It was a huge argument in my house as to who got to pick one out and keep it in their room. Teddy Tank is several children's items in one. 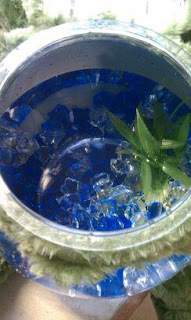 It is a fish/beta bowl equipped with a nightlight that give off a nice soft glow at night for a child's bedroom. The bowl is surrounded by a plush animal friend which can be dressed up with accessories depending on your child's interests. Teddy Tank also has a recorder that they can record their own voices or someone close to them. I had originally planed on this being a great way to bring in a first personal pet for Dane but as soon as Alana took one look at the website, she fell in love with the giraffe. After much argument we decided to let Dane pick out the frog. We plan on getting the giraffe for Alana for Christmas since she is so difficult to buy for in her teen years. 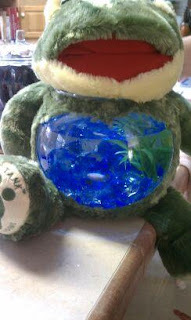 As soon as the Frog Teddy Tank arrived, Dane just had to go to the pet store to pick out a fish. We got two baby betas and named them Raph and Leo for the ninja turtles. Dane loves to feed them every morning before school and we frequently catch some random phrase he has recorded on it. The light works great too at night especially since we have finally gotten Dane in his own bed. This is just an all around good buy for children around the age of 5 and up I would say. Recommendation: I think these are great and for a really great price too! You couldn't buy the fish accessories alone for the same price and this is such a great way to introduce an easy to care for pet for your little ones. As I already said we are planning on buying another one here pretty soon. Giveaway: Teddy Tank is going to give one of A Lucky Ladybug's lucky readers a Teddy Tank Starter Kit of their own! I would pick the Pig. We would want the giraffe as a night light! I would like the giraffe if I won. Noraliza Galvan. I gave you +K on blogging! love to see reviews on toys or products for kids with special needs, like to help improve the coordination or fine motor skills. I love the frog! Too cute! I'd want to have the pearl white teddy bear. I entered the Step into Fall giveaway. I would love the dog tank! my daughter wants the frog one! entered country inns and suites group giveaway on your page. I like the elephant teddy tank! I like the chocolate Brown Bear. Thanks!